You want the mascot of your company / association for an event or to decorate your reception or your offices? Looking for giant objects or figurines in 3D for your POS or decor? 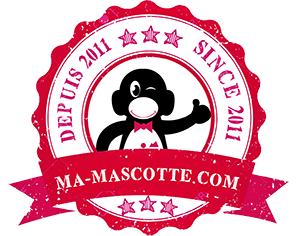 At Ma Mascotte, we design and manufacture giant sculptures (fiberglass or resin) for all our clients. We offer you the customized realization of works of art in 3D with perfect finishes. Each work is directly carved by hand by a competent artist for a customized rendering of quality. We create giant sculptures and figurines of all kinds: animals, characters, statues, objects, POS, furniture, etc. We are also specialized in the reproduction of masterpieces. Durable in time and lightweight, our custom made designs are perfect for attracting the eye and customers. Our custom-made statues and sculptures in resin or fiberglass are ideally designed for commercial entertainment, ornaments, films, product promotion, resellers, etc. Material: Resin / Fiber / Foam. Size: from 50cm to 300cm. Finishes: paints, varnishes, epoxy (matt or gloss). Reinforcement / socle if necessary. To define your need for custom sculpture; you have to ask yourself several concerning the use of this one. What will be the use of my sculpture? Ephemeral / sustainable in time? Exposed and accessible to the public (can be touched)? Desired degree of finish (smooth, medium grain, coarse grain, raw …)? Define your need for your future sculpture allows to adapt the type of manufacturing technique according to your constraints, expectations and budget. Example 1: a sculpture for an event that will last 4 months in a store can be made of polystyrene painted to minimize the budget. Example 2: Conversely, a sculpture for an outdoor amusement park that is solicited by the public can be made of resin that it must be more durable over time. In both cases the rendering can be identical but the technique, the budget and lifetime of the sculpture are not. * Do not pay anything ! Get your giant figure sculpture for FREE ! Benefit from the tax exemption at 100% of the amount of your figurine or giant statue. The sculptures and decorations we make are works of art by living artists. As such, tax deductions are available to businesses and the liberal professions as part of the acquisition of original works by living artists. Companies that purchase original works of living artists and enter them into a fixed asset account may deduct from the profit for the acquisition year and the following four years, in equal parts, an amount equal to the purchase price . However, the amounts are deductible only within the limit of 5 % of the turnover. In return for the tax advantage granted to it, the undertaking is obliged to exhibit the work, free of charge, in a place accessible to the public or to employees. Example: A company with a turnover of 1 000 000 € can amortize 5000 € over 5 years. It can therefore devote a budget of € 25,000 to the acquisition of a work. Keywords: giant figurines, decoration mascot, giant poster, giant object 3D, objects XXL, 3D creation, reproduction, Objects, animals, furniture, statues, people, posters, resin, fiberglass, cinema, advertising, television, stand, park attraction, museum, show, gardens, events.